Rethinking Faith and Church: Are You A Berean? I saw this cartoon on Facebook the other day and it gave me a good healthy chuckle. During his tithing sermon the pastor tells his parishioners, "Actually, the Greek word for tithe means 25%." 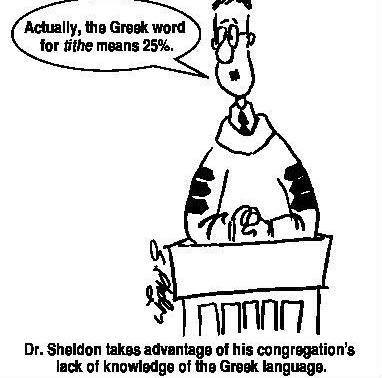 The caption then says, "Dr. Sheldon takes advantage of his congregation's lack of knowledge of the Greek language." Too funny! But seriously, the implication of this cartoon is that there are some pastors who are deliberately deceptive. Other than a bonafide 'Wolf in the Pulpit,' I have a hard time with that. Sure, some preachers might be deceived themselves, but I believe that the vast majority seriously believe that which they preach. This does, however, raise another question for me from the other side of the pulpit; the pew. There is, perhaps ironically, this age-old tendency for Christians not to know their Bibles and simply be told what to believe. Granted, since the Reformation days, we're doing better, but as I look around in my little corner of the world, I still see an attitude among some believers reminiscent of those old days when Bible reading was discouraged. I wonder why that is. I just cannot fathom why this lethargic attitude towards the Scriptures prevails. God has revealed so much of Himself within its pages that one would think that every Christian would daily spend time examining it for themselves. Unlike the suggestion in the cartoon, we don't have to have a knowledge of the Greek language either in order to know that something coming from the pulpit is true or false; there are plenty of good English versions to guide us in our quest for biblical literacy. Please understand, I do not mean this as the proverbial 'guilt trip.' This is just my own humble musing. Perhaps this explains why there are so many "dissensions and factions" (Galatians 5:20, acts of the sinful nature according to the previous verse) in the church today; some Christians are like the Bereans whereas some are not. Some test what they hear from the pulpit against the Scriptures, and some just blindly accept what they're told without question. Are you a Berean? Something to think about. Peace.